There's a lot of fancy pants drink recipes that I bookmark, with the hopes of making them for pals at future dinner parties. But so many of them are just plain complicated and I really don't have the patience to hand grind 500 vanilla beans, the know-how to ferment beets, and I have a liquor cabinet that is lacking in a million different kinds of bitters and I really don't care about rectifying that. So I went on a deleting rampage today and only the strong and simple survived. So here we have The Southside Cockatil - mint, gin, simple syrup, and lemon. 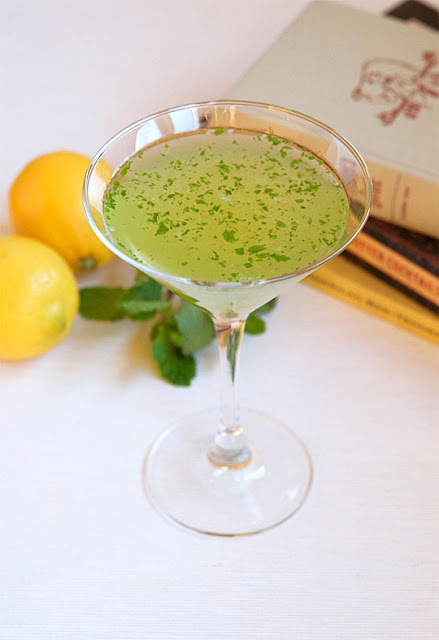 Lightly muddle the mint leaves in a cocktail shaker with a muddler or spoon. Add the gin, simple syrup, lemon juice, and ice. Shake vigorously for about 1 minute, until the shaker feels ice-cold. Strain into a martini glass and serve. "There are at least a couple stories about the origins of this drink. One is that it came out of Chicago during 1920s, where bars and nightclubs were divided by rival Irish gangs and their territories. According to this old NPR piece, the Northside gang made a drink of gin and ginger ale to hide the bad taste of bathtub gin, while Southside concocted their own using lemon juice and sugar. (Sweetening gin drinks to help the flavor was pretty common back then, as we’ve already seen with the Bee’s Kees cocktail.) Somehow along the way, mint was added. An alternate story is that the cocktail was created at the21 Club in Manhattan, where it caught on with the genteel set, who in turn made it the drink-of-choice at their Hamptons country clubs."